The lawyer representing the National Accountability Bureau (NAB) on Friday attempted to convince the Supreme Court to allow reopening the Rs1.2 billion Hudaibya Paper Mills reference to be reopened in order for justice to prevail. 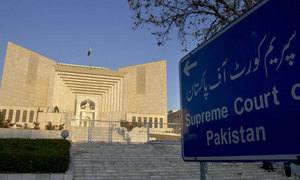 A three-judge SC bench — comprising Justice Mushir Alam, Justice Qazi Faez Isa and Justice Mazhar Alam Khan Miankhel — was hearing the appeal against a 2014 decision of the Lahore High Court to quash the reference. During the previous hearings of the case, the bureau struggled to satisfy the court on why the case should be reopened. The bench ─ asking for new evidence to be presented ─ had asked the bureau not to ‘parrot’ the Panama Papers judgement and rather articulate its own reasons to convince the bench why the reference originally filed against the Sharifs in the year 2000 should be resurrected. “You have to satisfy the court on the reasons for the delay in filing the appeal,” Justice Alam told NAB’s lawyer as Friday’s hearing began. The lawyer told the court that there are holes in the high court’s decision and the appeal must be reopened for the sake of justice. Justice Isa told the lawyer that the document on which the bureau has premised its case ─ the confession of former finance minister Ishaq Dar ─ has not been attached to the appeal for the reopening of the case. As the bench inquired when the charges against former prime minister Nawaz Sharif were framed, the lawyer responded that charges could not be framed as the accused was not in the country at the time. “The case went on for years and no charges were framed,” Justice Isa remarked. The court then asked the lawyer to submit before the bench the orders from the last hearing of the case at the accountability court. The lawyer told the bench that due to the stay order issued by the Lahore High Court, the accountability court’s proceedings were halted. Justice Miankhel noted that no stay order was attached to the appeal filed before the apex court. Retired Justice Shah Khawar, who was appointed as the bureau’s special prosecutor on Tuesday was present during Friday’s hearing and told the court that until the appointment of a prosecutor general, he will be supervising the proceedings of the Hudaibya case. “We have looked at all the merits of the case,” remarked Justice Isa, following which the bench said that it would announce its decision on reopening of the Hudaibya case shortly. The 2000 Hudaibya Paper Mills money laundering reference was initiated on the basis of an April 25, 2000 confession statement from Ishaq Dar, wherein he admitted to his role in laundering money to the tune of $14.86 million on behalf of the Sharifs through fictitious accounts. The LHC had quashed the case as the PML-N continued to claim that Dar’s statement was taken under duress. While Nawaz was not named in the interim reference filed in March 2000, in the final reference against the Hudaibya Paper Mills — approved by then chairman NAB Khalid Maqbool — the bureau had accused Nawaz Sharif, Shahbaz Sharif, Abbas Sharif, Hussain Nawaz, Hamza Shahbaz, Shamim Akhtar, Sabiha Abbas and Maryam Nawaz.